The commemoration of Buxtehude's death in 1707 has resulted in a flood of recordings of his sacred music. This part of Buxtehude's oeuvre, largely neglected, turns out to be of very high quality and shows remarkable variety. In 1667 Buxtehude was appointed organist at the Marienkirche in Lübeck. In this capacity the writing of vocal music for the services formed no part of his official duties. Most sacred music must have been written to be performed during the Abendmusiken, public concerts which took place on Sunday afternoons during the weeks of Advent. It was Buxtehude's predecessor Franz Tunder who had started the Abendmusiken in 1646 and under Buxtehude these concerts were extended and became more ambitious. Evidence of this is the fact that wind instruments were bought, and that additional balconies were constructed to have more space for all musicians who participated. This disc gives some impression of the kind of music performed during the Abendmusiken. The programme opens with 'Benedicam Dominum', a large-scale motet in 24 parts, for the performance of which Buxtehude will have made use of the balconies in the Marienkirche, as the 24 parts are divided over 6 choirs. It is a setting of verses from Psalm 34: "I will bless the Lord at all times". This is a true ensemble piece in which voices and instruments participate on equal terms. The scoring of cornetts, trumpets, trombones, dulcian and great bass shawm, with the usual strings and basso continuo underlines the content of the text, but Buxtehude doesn’t miss the opportunity to single out the words "audiant mansueti" (the humble shall hear thereof) through a modulation. The impression of this piece in the Marienkirche must have been overwhelming, and La Capella Ducale and Musica Fiata emulate that here. Buxtehude's sacred works are mostly called 'cantatas', but he himself never used that term. It is also a little imprecise, as there is a lot of variety in his sacred oeuvre, as this disc shows. Some of the compositions on this disc are so-called 'concerto-aria-cantatas': a combination of texts from the Bible, chorales and free poetry (aria). The second item on the programme, 'Gott hilf mir', belongs to this category. It starts with texts from the 69th Psalm (Save me, God, for the waters are come in unto my soul) and verses from Isaiah 43: "Fear not, for I have redeemed you". They are set for bass solo, and contain some examples of word painting. Then the full ensemble comes in with a short quotation from Psalm 130 ("Israel, hope in the Lord") and the chorale "Wer hofft in Gott und dem vertraut", the 5th stanza of the hymn 'Durch Adams Fall ist ganz verderbt' (Lazarus Spengler, 1524). This is sung on original music; the hymn tune only appears in the strings. Then follows the aria: "Ach ja, mein Gott, ich hoff auf dich" (Ah yes, my God, I hope in you), set for two sopranos and bass. The cantata ends with the full ensemble, quoting again Psalm 130: "Let Israel hope in the Lord". Wolf-Mathias Friedrich sings the bass soli very well, and he and the two sopranos blend well in the aria. 'Wie wird erneuet, wie wird erfreuet' is an example of the so-called 'Lied-Kantate', a cantata on a strophic text of free poetry. This kind of cantata is especially associated with German Pietism. The text is by Erasmus Francisci and was published in 1675 as part of a meditation over Psalm 84, about being close to the Lord and his temple. This aria describes the joy of the soul about the redemption through Christ, using images which are typical for German Pietism. The stanzas where the text is most intimate in character (2 – 7) are set for solo voices, the first and last stanza for the tutti. The intimacy of this piece is impressively realised by the ensemble and its soloists. 'Wo soll ich fliehen hin' is another 'concerto-aria-cantata', and described as a 'dialogue'. But that dialogue only takes place in the first section, where the bass acts as 'vox Dei', quoting texts from the Old and the New Testament. The troubled soul – sung by a soprano - begins with the first stanza from the chorale 'Wo soll ich fliehen hin' by Johann Heermann, published in 1630 in a collection of 'Trostgesänglein' (hymns of consolation): "Where shall I flee? For I am burdened by the weight of many sins". The 'vox Dei' answers with Matthew 11, vv28-30: "Come unto me, all you who labor and are heavy laden". Another stanza of the chorale follows, and then the bass quotes Matthew 7, v7 with the words "knock, and it shall be opened to you'. The aria in three stanzas – set for tenor solo – links up with this: "Knock on heaven's door, and it shall be opened to you"; it is beautifully sung here by Markus Brutscher. The knocking is depicted by repeated notes in the strings. After the aria the cantata closes with two stanzas from another chorale, 'Herr Jesu Christ, du höchstes Gut' (Bartholomäus Ringwald, 1588). The first is for soprano solo, the second for the tutti (four voices and instruments). Both Wolf-Mathias Friedrich as 'vox Dei' and Monika Mauch as the troubled soul are giving splendid performances. The latter's singing of the chorales is an example of how German chorales should be sung. Another 'Lied-Kantate' follows: 'Mein Gemüt erfreuet sich' is a rather simple strophic setting for soprano, alto, bass and instruments of an anonymous text which was published in 1679 as part of a collection of hymns for New Year. The text is about the soul rejoicing about Jesus and his goodness. Instruments are mentioned as playing in praise of Jesus, and at these moments Buxtehude lets them play: in the fourth and fifth stanza we hear trumpets, dulcians, flutes (recorders), the regal and cornetts. The sixth and seventh stanza refer to the birds singing their Creator's praises – in this performance the organ depicts their singing in its upper register. Then suddenly the ninth stanza modulates into minor mode and slows down to 'adagio': "Man, O man, you image of God! Why do you show your wild side? Do nothing but worry your whole life long about clothing, food and drink?" Then Buxtehude returns to major and the original tempo and metre: "Do but think of that day when eternal life will be ours". Another dialogue is 'Ich lasse dich nicht, du segnest mich denn', set for tenor, bass and instruments. The text is from Genesis (ch 32, vv 26-29), about the wrestling of God (bass) and Jacob (tenor). In this piece Buxtehude makes use of the 'stile concitato', which we know from Monteverdi's 'Combattimento di Tancredi e Clorinda'. The dramatic character of this dialogue is excellently realised by Markus Brutscher and Wolf-Mathias Friedrich. The disc ends with another 'concerto-aria-cantata', which was very likely written to be performed on the second Advent. The Gospel reading for that Sunday was about the second coming of Christ, and that is what the aria in the centre of the cantata is about: "So do come, Jesus, come quickly, to free us completely." This aria is preceded by two quotations from the Bible, from the Letter of Judas and from Revelation, set for the tutti and for bass solo respectively. The cantata opens and closes with two stanzas of the chorale 'Ihr lieben Christen, freut euch nun' by Erasmus Alber (1546). They also refer to the second coming of Christ and the last judgment: "Oh, dear Lord, hurry to judgment, show us your glorious countenance, the nature of the Holy Trinity, that God may help us in all eternity. Amen." The scoring of this cantata, including muted trumpets and trombones, gives it a rather introverted character, which fits well into the atmosphere of expectation which belongs to Advent. Last August I heard these ensembles with the same programme during the Utrecht Festival Early Music. It was a stunning and often deeply moving performance – for me one of the lasting memories of this year's festival and even one of the highlights in the festival's history. That was partly due to the quality of Buxtehude's music, but also to the brilliant performance by La Capella Ducale and Musica Fiata. This is the kind of music which runs in their blood: they feel totally at home in this repertoire. A thorough understanding of the German culture of the 17th century and the religious climate of the time is an essential precondition to reveal its spiritual depth. And that is exactly what the ensembles do here. The atmosphere and the acoustical circumstances of a live performance can never be emulated by a recording. Even so I am deeply impressed by this disc. 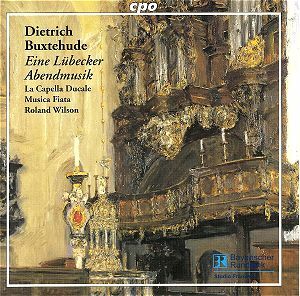 I believe this is the best recording of Buxtehude's sacred music ever made - very closely followed by Cantus Cölln's recording of 'Membra Jesu nostri'. I cannot recommend it strongly enough. It is a disc to listen to over and over again. If this doesn't convince you that Buxtehude's sacred music is first-rate, nothing will.